Famed painter James McNeill Whistler was born in America but he spent most of his life in Victorian London. And although his background was international - he was raised in Russia before training as an artist in France - much of his work focused on the local. 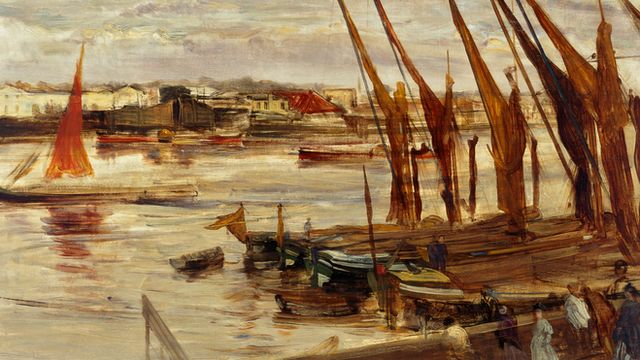 Throughout the 1860s and 1870s Whistler was drawn to the bustling and rapidly changing urban neighbourhood surrounding Battersea Bridge - and, of course, to the River Thames that flows beneath it. Margaret MacDonald, one of the curators of "An American in London: Whistler and the Thames" at the Smithsonian's Arthur M Sackler Gallery in Washington DC, talked to the BBC about this pivotal period in Whistler's career.